Reports suggest that Gor Mahia players did not train on Tuesday while demanding their match winning allowances. Club official David Kilo acknowledged the player strike but insisted that the club is working round the clock to resolve the outstanding allowances. Gor Mahia are supposed to be busy preparing for their Africa champions league return leg against AC Leopards. The club has also organized a fundraiser scheduled for Tuseday to defray expenses related to their travel to Congo. The issue of constant player strikes and go-slows makes it more urgent that the club put in places procedures that will provide a measure of financial stability. It remains to be seen whether the club will ever move forward with such measures or whether they will continue to maintain the fire brigade approach where they wait until the building is on fire before dousing it with water. Meanwhile with no matches scheduled for several days, coach Frank Nuttall has taken a brief opportunity to visit his family. Reports suggest that Nuttall has taken several days off leaving Frank Ouna and Bobby Ogolla in charge. “Since we have not had any activity, the coach decided to take a break and visit his family. We expect him back on Thursday and will train with the team for three days before we play AC Leopards,” Ouna told goal.com. Being away from your family for several months is not easy and the club certainly cannot begrudge the coach an opportunity to visit his family. The rest will leave him refreshed and ready to resume the fight for the local league title. Among the players who has trained with Gor Mahia in the past few days is David Owino Calabar. He is ineligible o play for Zesco in the champions league and as such has returned to Kenya to keep his fitness up. Calabar has had a good start at Zesco which includes scoring two goals in the Zambian Supercup. The fund raiser to raise money for the trip to Congo will be held on Tuesday. The club’s vice president, David Kilo also said that fans who cannot attend money can send money via the paybill number 350100. Once again Gor Mahia faces an uphill task as they try to raise enough funds to travel to Congo for the return leg against AC Leopards. According to goal.com, The team needs more than Sh5.2million to cover air fare and accommodation costs while in Congo, Brazzaville. A top club official admitted the struggles and said they are working round the clock to ensure they are able to honor the fixture. When Gor Mahia needed to travel to Madagascar to play CNaPs, it was former Gatanga MP Peter Kenneth who came to their rescue. Dirkir Glay has been conspicuosly missing from Gor Mahia league matches of late due to the fact that his work permit has not been processed. According to club official Ronald Ngala, his paperwork has already been submitted and the club is awaiting a response from the ministry of labor. “We have already received communication from the authorities confirming receipt of our documents and soon we’ll get Glay cleared for domestic competition.” said Ngala to the Standard. One is left to wonder why the club has not had enough foresight to apply for his work permit ahead of time, given that they signed him two months ago.Glay’s inclusion in the defence will help shore up what has proven to be a less than solid department. Posted in: Articles, NewsTagged: Gor Mahia membership, Gor Mahia sponsorship18 Comments on If transparency is difficult, why not outsource it? 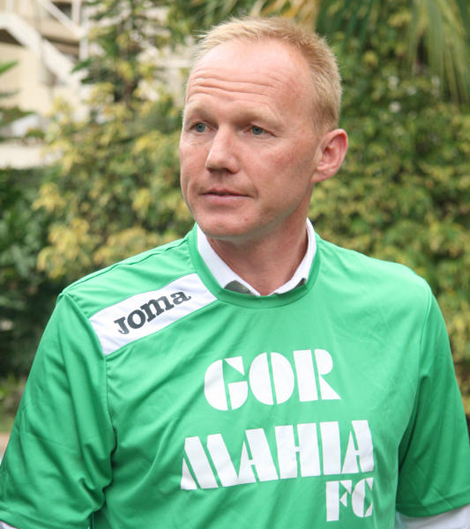 When Gor Mahia were registering poor results during pre-season friendlies, coach Frank Nuttall told fans to be patient. Many did not listen. Matters came to a head when Gor Mahia lost to Bandari in Mombasa and fans unhappy at the poor display expressed unhappiness resulting in a bitter exchange between fans and some players. But coach Nuttall stuck to his guns trying various combinations while telling fans that the team was still gelling. Now Gor Mahia has gotten off to a brilliant start. Three league wins in three matches is the best start Gor Mahia has had in recent years. In 2013, Gor Mahia started with 2 draws. And in 2014 it was 2 wins and a draw. But Nuttall knows that there is still a long way to go and players must remain focused. “We are all happy we are winning, but we must go step by step. We should not be carried away but the wins. The fans can savour the wins, but for the players, it is important to remain focused. Immediately we are done with one match, we shift attention to the next. All I can tell my players is not to get carried away. Let us celebrate when we ultimately finish the job.” ” he added. The porous defence is worrisome. Consider that in 2013, Gor Mahia played the first four games without conceding a goal. This was thanks to a no nonsense defence with players like Calabar, Mosoti, Musa, Jerim among others. 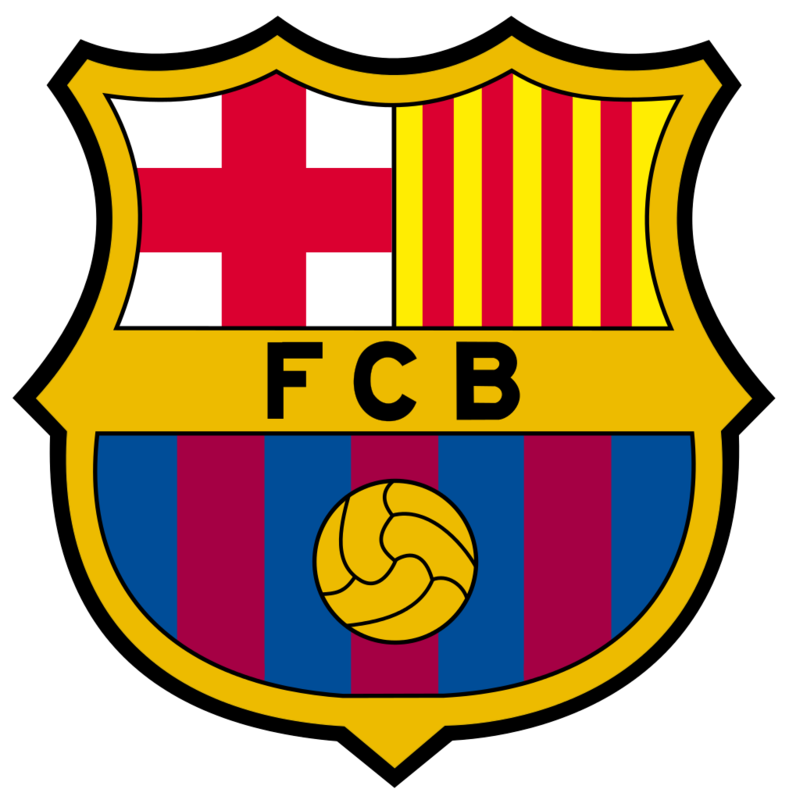 In 2014 they conceded only one goal in the first five matches. Yet this season they have conceded four goals in three matches. But Nuttall is unperturbed and sees opportunity for improvement. “All we are looking for is a win and that is what we are getting. As for the conceding of goals, I am not very particularly disturbed but I know we will improve,” he said. It is also worth noting that though Gor Mahia were not conceding goals in 2013, they were also not scoring. In 2013, it took a while before new signing Kiongera gelled with Rama Salim, Lavatsa et al. And in 2014, the strike force was so dependent on Sserunkuma that some Gor Mahia fans dubbed it the “Patia Sserunkuma tactic“. It looked like Gor Mahia midfielders had one mission which is to find Sserunkuma whether it was via long balls or short passes. This was detrimental as Blackberry often appeared lost. Nuttall’s re-entry breathed some life into Blackberry who found his role, as well as Timothy Otieno. Nuttall is now working on creating a multi-dimensional attack that can worry opposing defences from all angles. The net result is that Gor Mahia have scored 9 goals in three matches. Contrast this with 2014, where they scored 9 goals after 8 league matches. And in 2013 they scored 9 goals at the 10th league match. It has taken the team less than half the time to reach 9 goals this time around. 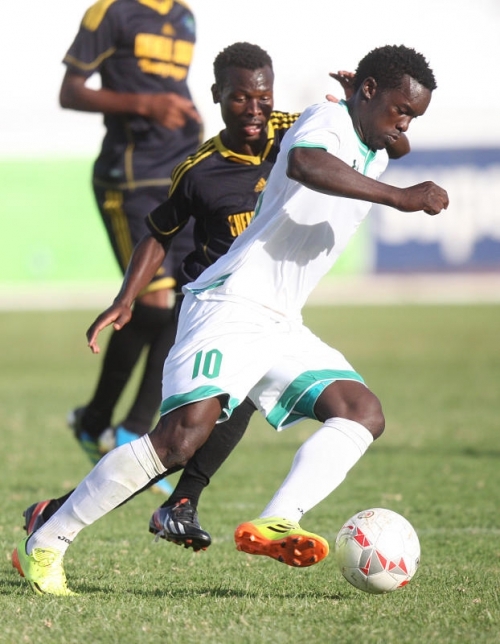 One player who has been instrumental in Gor Mahia’s brilliant start is Ali Abondo. The Kisumu lad has found the back of the net 8 times in all competitions. His ability to make astute and well timed runs and then calmly plant the net is reminiscent of the legendary Hezborn Omollo who scored over 20 goals in the leagues of 1983 and 1984 and scored 15 goals in 1985 and is likely the most prolific striker ever to don the Kogalo jersey. This is the same Abondo who was jettisoned in 2013 with technical bench members accusing him of not working hard enough. Abondo has learned from the past. This is the same Abondo whom first questioned his return to the squad with some saying that Gor Mahia should have brought back Kevin Omondi “Ade” instead. But no Gor Mahia player nor fan will get carried away. Only three matches have been played so far. And even a prolific striker like Sserunkuma cannot be expected to continue the breakneck pace that Abondo is scoring goals. But the newly focused Abondo with guidance from coach Nuttall will find ways to contribute whether he is scoring goals or tenaciously defending and putting in timely tackles as he did back in 2013. A player can be called upon to play different roles in each game. And Gor Mahia will remain grounded and humility will prevail knowing that all is not perfect. Speaking of humility, two encounters that gave Kogalo a dose of humility is the matches against CNaPs where Gor Mahia barely scraped through and the match against AC Leopards whom Gor Mahia will face in the return leg. Gor Mahia will be looking for a miraculous 2-1 win in the second leg. The fact that the Wednesday night match against SoNy Sugar has been postponed will only help by giving Gor Mahia more time to prepare and to avoid injuries. Also, fewer midweek matches and more weekend matches is good for the club’s financial coffers. Whatever the score is in Congo, Gor Mahia players will gain experience. And the continental sojourn has sharpened Gor Mahia players leaving Chemelil Sugar coach Mike Mururi to lament. Peace will finally prevail in the Kenya football scene. A three man delegation has been sent by FIFA to resolve the standoff that has lasted four months. 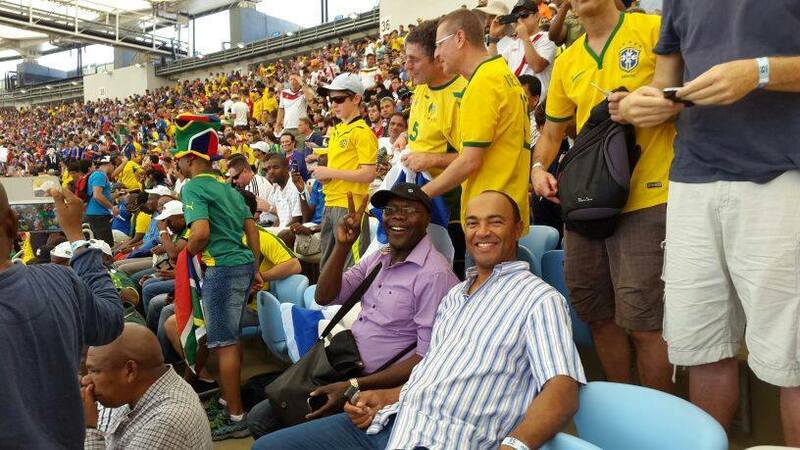 : Ghana FA President Kwesi Nyantakyi who also sits in FIFA’s Associations Committee, Ashford Mamelodi ,Fifa’s development officer of Southern and Eastern region and Italian Primio Carvalao, who is head of Fifa Football Associations. The FIFA delegation has finally gotten the two warring sides to come to an agreement. Under the agreement, the KPL will continue as currently constituted with 16 teams in 2015 and will be considered the top tier league. KPL will also be allowed to fulfill its contractual obligations with sponsors. The league shall however be renamed the FKF Premier League to emphasize the fact that it is still run under the auspices of FKF. FKF shall also continue to run their league now renamed the National Super League. In June the two warring sides will sign an MoU under which the league shall transition into an 18 team format. Under the current plan, four teams will be relegated and 6 teams promoted. FKF chair Sam Nyamweya had taken his opponents by surprise when he announced a lucrative deal Tanzanian TV giant Azam. The deal worth Ksh 207 million over three years is to see each club paid Ksh 1 million per month for 10 months. It gave Nyamweya a strong bargaining chip and put him in prime position to be re-elected in October since he now controls the purse strings of many clubs. Nyamweya now says the two leagues will be harmonized in 2016. The entry of Azam into the Kenyan market is a good thing as it forces Supersport to pull up their socks by offering better deals to club, by making matches accesible to more fans via free to air TV and by enhancing mobile and online services, all of which Azam currently does much better than Supersport. And unlike Supersport, the terms of Azam TV deals are not shrouded in secrecy. Nobody quite knows what the current deal between KPL and Supersport is. It has supposedly been leaked to the media but the sources are unverified. With peace now prevailing at least for another year, clubs are now free to focus on their respective league campaigns. Chairman Ambrose Rachier can now return to running the club instead of shuttling back and forth from his office to Milimani law courts to address Nyamweya’s latest salvo. he can now resume the task of shoring up the club’s finances and resume the search for a sponsor. The return of normalcy and certainty should also see a return by many fans who had abandoned the league and perhaps even draw sponsors to the league and individual clubs. The biggest losers in this arrangement are probably Posta Rangers who had rightfully earned a place in the top tier league but are now stuck in the second tier. As for Nakuru All Stars, this standoff has benefited them as they were due to be relegated. But going by their current performance, they never learned from last year’s debacle. Gor Mahia coach Frank Nuttall has lauded his players for shrugging aside the congested fixtures and winning their third successive match in the Kenya Premier League. Nuttall lauded Khalid Auch for his goal saying he has been working with Aucho on shooting during training and it has paid off. Chemelil coach Mike Mururi has admitted that his side were beaten by a fitter more efficient side. He blames the lack of competitive games. Fans will remember that this is the same Mururi who last season said Gor Mahia only won because they are helped by referees. Khalid Aucho opened his scoring account for Gor Mahia as they beat Chemelil Sugar 3-1 in a Kenyan Premier Match played on Sunday 22 March at the Nyayo Stadium from 1615hours. Aucho, Ali Abondo and Meddie Kagere scored Gor’s goals while Meshack Karani scored Chemelil’s consolations goal. Gor hit the ground running and in the third minute were awarded a corner that was brought in by Abondo but it was too wide. In the 11th minute, Fredrick Onyango punched the ball back into the field of play and it was picked by Michael Olunga who managed to hold off two Chemelil players before setting up Abondo who handled the ball before he could shoot and the whistle was blown. There was a scare for Chemelil in the 12th minute when Onyango rushed out of the box to try and prevent Olunga from racing into the box but he missed the ball before fouling Olunga. He however was not sent off and was given a yellow card. The resulting free-kick was brought in by Abouba Sibomana and forced Onyango to tip the ball over the bar for a corner that was fruitless. In the 26th minute, Chemelil missed a chance to score after Karani was disposed in the box and the clearance found Stephen Wakhanya outside the box but he shot over the bar. In the 36th minute, Gor breathed a sigh of relief after Harun Shakava made a last minute tackle to deny Wakhanya a shooting chance inside the box. In the 41st minute, Kagere won a free kick that was brought in by Sibomana before it was cleared by Chemelil, it however found Aucho who exchanged passes with Olunga before he released a hard shot into the back of the net. Two minutes later, Olunga scored but the flag was already up. When play resumed in the second half, Onyango was forced to make a finger tip save from a Sibomana free kick. A minute later, Gor doubled their lead through Abondo. This followed the subsequent corner that found Olunga in the box but his shot was blocked only for the rebound to fall on Abondo who made no mistake from the right side to give Gor their second goal. In the 67th minute, Aucho missed a chance to hit a brace after a good Olunga found him in the box but his shot went wide. In the 80th minute, Olunga crossed in the box but with Onyango already out of his line, no Gor player could connect with the cross. With four minutes to the final whistle, Chemelil pulled one back through Karani. This was after a Chemelil free kick that was brought in by Collins Kisuya and Boniface Oluah came off his line to try and pick the ball but Dennis Onkangi beat him to it before the latter pulled the ball back for Karani to put into the empty net. Any hopes Chemeili may have had of a comeback were killed when Kagere scored his second goal and Gor’s third goal. Godfrey Walusimbi played a one-two with Olunga before the former made a run into the box but he was disposed by Kisuya with a sliding tackle only for the ball to find Kagere who made no mistake from close range. The win means Gor now have nine points from three games while Chemelil have a single point, gained from their barren draw with AFC Leopards. Gor Starting XI:23. Bonface Oluoch. 5. Musa Mohamed. 14. Karim Nizigiyimana. 3. Abouba Sibomana. 2. Godfrey Walusimbi. 10. Khalid Aucho. 6. Collins Okoth (20. Ernest Wendo 90′). 18. Harun Shakava. 22. Meddie Kagere. 30. Ali Abondo (25. George Odhiambo 89′). 19. Michael Olunga. 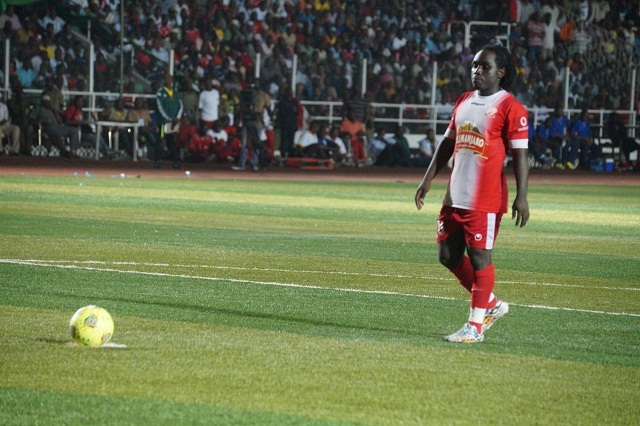 Bonface Oluoch – Musa Mohamed – Karim Nizigiyimana – Abouba Sibomana – Godfrey Walusimbi – Khalid Aucho – Collins Okoth – Harun Shakava – Meddie Kagere – Ali Abondo – Michael Olunga. The salaries of the technical bench members were also paid. Dan Sserunkuma who lit up the Kenyan scene for four years, is finding the going rougher in Tanzania. He now wants out of Simba after having spent most of the time warming the bench. This he thinks is detrimental to his career. Sserunkuma had returned home to Uganda to address family issues. But while there, he sent a communication to Simba asking to terminate his 2 year contract after only serving half a year. Simba for their part have expressed a willingness to end the contract stating that Sserunkuma did not meet expected standards and that the contracts of international players can be terminated for lack of performance. This according to top Tanzanian magazine, Mwanaspoti. Gor Mahia beat Bandari 2-1 in a Kenyan Premier League match played on Thursday 19 March at the Nairobi City Stadium to move three pints clear at the top of the Kenyan Premier League table. Gor was the better side from the start with Abondo, Kagere, and Olunga having attempts on Bandari goal early in the match but they could not find a breakthrough in the opening minutes. Gor’s persistent pressure finally paid off after 23 minutes of play as striker Michael Olunga fed his strike partner Meddie Kagere who calmly slotted past Bandari goalkeeper Wilson Obungu on his full debut to give Gor a much deserved lead. The hosts’ lead however lasted for only five minutes as former Nairobi City Stars midfileder Lawrence Kasadha drew the Dockers level from a set piece curling the ball from the edge of the area past Boniface Onyango on Gor Mahia goal. The two sides left for a breather with scores level in a half that Gor would have scored more goals had they been more clinical in front of goal. Gor started stronger after the break making inroads into Bandari penalty area the pressure paid off once again on 62nd as Michael Olunga was brought down in the area and Ali Hassan Abondo stepped up to restore Gor’s lead from the spot. The defending champions pressed on after the goal but could not find another goal a result that saw them bag three vital points and they sit comfortably at the apex of the Kenyan Premier League table.